Sorry for the grammar, typing fast, been out of the office awhile and sifting through emails. The world record class brown bear in the Anchorage airport is 10”2 and I believe a 29 inch wide skull, a couple rub spots and estimated at 1500 lbs. The preliminary tape was 10”2 and that was before it was fleshed out. After fleshing out, it usually gains 2 to 3 inches. Unfortunately the skull was just under 28 inches which hits just below the B&C all time record books radar. Almost got my second B&C entry! It will score for 2007 though if I enter it. Claw to Claw across the top was 10”01, and the front pad was 9.5 inches across, not a single rub spot. The best part of the trip was the plane ride back home, sitting in between the hosts and crew of three hunting television shows that are on a national network and have many DVD’s in retail locations, catalogs, etc. 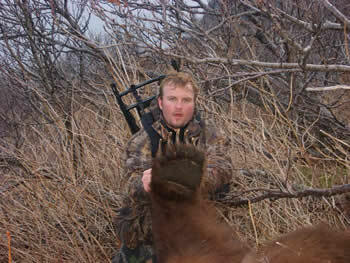 A guided Kodiak brown bear hunt averages $20 thousand. For locals they have the draw tag system or option to pay a guide, people try to draw for a life time, I got it on the third year. I had dropped all my gear off several hours before my flight home and was in Kodiak a few days celebrating with friends. I was in my work clothes for the flight while the rest of the airport looked like a hunting catalog had thrown up in the terminal with all the people in their camo gear. I had a good time listening to each of the hosts tell me about their show and how they come up every year and stay from around April 1st through the end of the season May 17th. That this was always the big show that everyone tuned into each year. 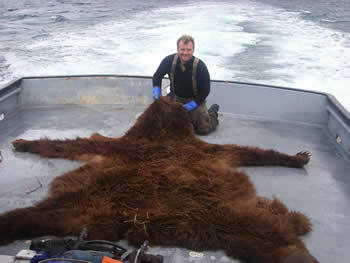 One explained how they got a 9”6 the previous year and how big of a bear that was, that it took 9 shots. Another explained how this year they wounded a bear and it then bedded down in the Alders and was then spotted two days later feeding and then two weeks later breeding with a sow. The strength and mass of these bears is astounding. We measured the forearm when we were dressing mine out, it is bigger than my thigh. I’m 6”5 , my thigh isn’t that small. It took three of us over six hours to dress out the bear. Alders mind you are very dangerous scrub brush that cover Alaska, usually about 7 feet high with very low visibility, seven times out of ten you hear a bear coming through the Alders at you before you see them. (sounds literally like a steam roller barreling through, Crash! Crash! Crash!) You can see alders in the photo. Then one camera man further explains how they were within 93 yards, very scary that close, makes for good television. Honestly they were very nice, very genuine guys, not arrogant at all as one would expect. You could tell they were very skilled sportsmen and wildlife conservationists. Then one asked what I did in Kodiak… I got to explain. No I was hunting too, I live across the water. Very sheepishly, almost like come on I am too quite and too modest. They all responded, “ohh great, that is good that the local guys get to have the experience too” , “ did you have any luck?” I nodded yes, and they asked if I had pictures…I pulled out my little zip lock bag with a digital still shot camera and my digital video recorder about a 10nth the size of the $30 thousand dollar carry on camera equipment the crew had. I handed the camera to the guys of the one with me on the boat. No one said a word. They passed it around, one of the host’s of a show leaned forward and looked at me and then passed it to another guy. How big is that? So far it is 10”2 for sure but it hasn’t been fleshed yet. How far away were you when you shot it a camera guy asked. “Well my buddy and I don’t like to shoot any further than 50 yards, so I would say about 30 yards.” And they started choking, laughing, and roaring 🙂 They couldn’t believe it. They were so jacked up and loving it. 2 shots at 50 yards on Mothers day. Right now it will either take a tour around the state at some retail locations or head to the west coast somewhere. It was too big for us to move and take the traditional photo’s. It was also late and about to get dark, there were others bears circling us as well. Overall it was a good time, had some great stalks, watched one boar go after an elk, watched another boar attack some cubs to get the sow into heat, got into some fun sea’s in the Shelikof straits, waves sunk the skiff one day as we got to shore on Afognak island, almost lost our gill net to some whales as we were setting it to try and catch the islands first red salmon for the season, watched three bears at 50 yards on three different days, and had an 8 or 9 foot sow charge through the alders about 45 minutes before I took the bruin in the photo. I apologize, but as many of you have heard me say, words don’t do an ounce of justice…those of you who hunt and especially those who have ever looked into the eye’s of a brown bear before know what I mean. Take care everyone. I’ll let you know where the bear ends up. It will be about two years before the taxidermist is done. And for the PETA members out there, the effective hunting game management in Kodiak has directly resulted in the consistent annual sustainable increase in the brown bear population as well as overall size increase for healthy cubs. Believe the science not your feelings. Welcome to the 14th annual Reno Knights Memorial Day Tournament! Once again this year, we have assembled a great field of teams to kick off your 2007 summer season. We have 12 teams playing for the championship this year. The tournament will also be played at different sites this year. Each team is guaranteed 5 games and the top three teams from each bracket will play a 6th game in the championship round. The tournament dates are Thursday, May 24 through Monday, May 28, 2007. Welcome to the 19th Annual Josh Anderson Memorial Tournament. This year’s tournament will once again be filled with excitement and quality, competitive baseball. The tournament will take on an entire new look for the 2007 competition. In 2006, Coach Powers and the baseball program at the University of Nevada completed their stadium improvements. They have installed field turf and lights which makes Peccole Park one of the best baseball stadiums in the United States. With the addition of lights, all the games of the Josh Anderson Tournament will be played at Peccole Park.The tournament is without a doubt one of the most prestigious tournaments on the west coast. With teams from California, Nevada, Washington, Hawaii, Oklahoma and Idaho, many of the best players in the country have been highlighted throughout the tournament’s history. Many of the tournament alumni are now playing either in the major leagues, the minor leagues, or collegiate baseball. We really appreciate all the teams that continue to come back to Reno and play in this fine tournament. Some of your organizations have been coming since the tournament started and that is greatly appreciated. If there are any questions, please contact Pete Savage at 775-828-4193. All pre-game warm-up must be done in the outfield areas beyond the infield dirt areas. No catch or pepper played in front of dugout areas. No soft toss into any fences! The 2007 4th of July Tournament will be held from Thursday, July 5th through Sunday, July 8. All games will be played at either Reno High School, Wooster High School, or Damonte Ranch High School. There will be two brackets with a round robin which will determine seeding. After round robin play, teams will be seeded according to their win-loss record into the championship rounds on Sunday.